MIDLAND, Texas, March 4, 2019 /Christian Newswire/ -- ChinaAid has released its 2018 Annual Persecution Report, demonstrating China's sharp escalation of human rights and religious freedom abuses over the past year and providing key examples. 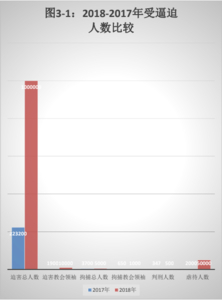 Photo: A chart from ChinaAid's 2018 Annual Persecution Report comparing the documented number of Christians persecuted in 2018 (red) with the number of Christians persecuted in 2017 (blue). The report, published in both Chinese and English, catalogs cases of China's oppression of Christians and contrasts them to cases documented in 2017, concluding that there has been a steep uptick in religious suppression in 2018. While ChinaAid sympathizes with the plight of all those persecuted for their beliefs and fights for the rights of all, the majority of the reports we receive concern Christians. As a result, the report focuses on Christian persecution in particular. Additionally, because many Chinese Christians fear for their safety if they speak out, it is impossible for ChinaAid to collect every religious persecution case. However, those presented in the report have been verified, and the findings can be considered representative of Christian persecution in China in 2018. The English version of the report can be read here, while the Chinese version can be read here.